Katie Derham introduces the celebrations live from the Royal Albert Hall as the world's greatest music festival reaches the grand finale of its 120th anniversary year. Katie Derham introduces the celebrations live from the Royal Albert Hall as the world's greatest music festival reaches the grand finale of its 120th anniversary year. Tenor Jonas Kaufmann, soprano Danielle de Niese and pianist Benjamin Grosvenor are the star soloists in a programme which includes popular favourites by Gershwin, Lehar and James P Johnson, as well as a performance of Grieg's Morning from Peer Gynt, which appeared in the first ever Last Night in 1895. Around the UK, Proms in the Park audiences in Belfast, Glasgow, Swansea and London will join the Royal Albert Hall for a medley of favourites from The Sound of Music to mark the 50th anniversary of the classic film. Each of the four parks will also have their moment in the spotlight as part of a UK-wide singalong of Aaron Copland's I Bought Me a Cat, before the traditional climax of Rule Britannia, Land of Hope and Glory and Jerusalem. 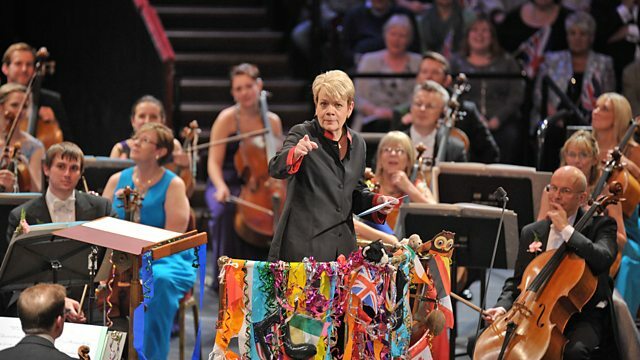 The BBC Symphony Orchestra and Chorus and the BBC Singers are conducted by Marin Alsop. Via the red button, viewers can also see highlights of the Last Night celebrations from all four parks. Or choose a park and watch its concert live and in full through bbc.co.uk/proms. Orchestra: BBC Symphony Orchestra. Conductor: Marin Alsop. Orchestra: BBC Symphony Orchestra. Performer: Benjamin Grosvenor. Conductor: Marin Alsop. Orchestra: BBC Symphony Orchestra. Singer: Danielle de Niese. Conductor: Marin Alsop. Orchestra: BBC Symphony Orchestra. Singer: Jonas Kaufmann. Conductor: Marin Alsop. Orchestra: BBC Symphony Orchestra. Conductor: Marin Alsop. Choir: BBC Singers. Choir: BBC Symphony Chorus. Orchestra: BBC Symphony Orchestra. Singer: Jonas Kaufmann. Conductor: Marin Alsop. Choir: BBC Singers. Choir: BBC Symphony Chorus. Music Arranger: Malcolm Sargent. Orchestra: BBC Symphony Orchestra. Conductor: Marin Alsop. Choir: BBC Singers. Choir: BBC Symphony Chorus. Orchestrator: Edward Elgar. Orchestra: BBC Symphony Orchestra. Conductor: Marin Alsop. Choir: BBC Singers. Choir: BBC Symphony Chorus. Music Arranger: Benjamin Britten. Orchestra: BBC Symphony Orchestra. Conductor: Marin Alsop. Choir: BBC Singers. Choir: BBC Symphony Chorus. Music Arranger: Cedric Thorpe Davie.